You really don’t have to be a professional hiker to experience the most stunning hiking trails in the world. Most of the times, you would do a fine job when you are an adventure seeker, backpack the right supplies and set off to explore the beauty this planet has to offer. You must also ensure that you are fit to travel when you make your way to these beautiful hiking trails in the world. Here are some that you would be delighted to experience. The Inca Trail in Peru is a 33 km long journey of discovery and truly one of a kind. The trail offers a lot to the tourists, from a journey to jungles and historical ruins. The most wonderful part is the stop at the Sacred Valley of Machu Picchu. This hike would take over four days and is filled with countless surprises along the way. The Narrows in USA is meant for fun lovers because the adventure is truly amazing. The hike through the Virgin River will make you entirely wet as you swim through the river because the canyon is really narrow. You must be wearing the right clothes to enjoy it. The Blyde River Canyon in South Africa is another astonishing hiking trail that offers biodiversity next to none. The red cliffs and picturesque water cascades are delightful to look at. Who hasn’t heard about Mount Blanc and its picturesque views? During the summer months, Mount Blanc is one of a kind and a hike you must take if you are a happy mountain walker. Mindful travel is really the only right way to travel. You might have taken countless trips along the way, but nothing touches the soul better than when you travel wholeheartedly and embrace the journey with an open mind. People travel for different reasons. Most of the times, we just want a break away from reality and would do anything for a getaway. There’s no harm in it. However, your intentions need to be set straight beforehand. The purpose of travel will ultimately guide you to have a better journey. When you plan for your trip, it is important to just look beyond the cheaper airfares and hotel deals. Researching well is the key to achieve a fulfilling travel experience. Begin by reading books about the destination. Go an extra mile and do all it takes to be passionate about your destination. It’s also important to write about your travel journey. You could spend little time every day while you sip coffee. This is a great time to reflect back on your thoughts and absorb the new destination in the best possible manner. 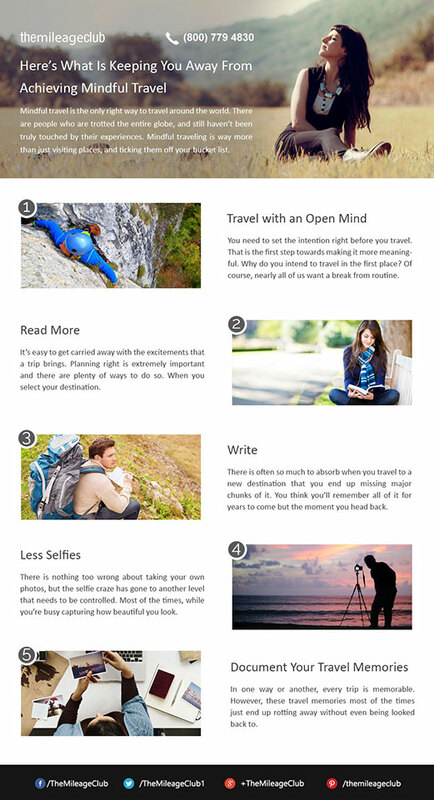 Lastly, to achieve the state of mindful travel is it important to come out of the selfie craze and document your travel memories in a better manner. Capture meaningful moments and store them in creative ways so that they are always great to look back to! Family breaks are amazing in every manner. You get a time off from the monotonous routine and set out to explore a new destination. The experience is one of a kind, because you bond together and make everlasting memories. If you still haven’t sorted out the destination for the upcoming family vacation, here are some places which you must consider. If you really wish to be somewhere grand with your family, the Grand Canyon is a perfect choice. It’s a natural wonder that leaves tourists awestruck. It is particularly very crowded at some parts of the year. While you are there, you can indulge in countless adventures. Orlando needs no definition. For adults and kids alike, it is a complete world of entertainment. 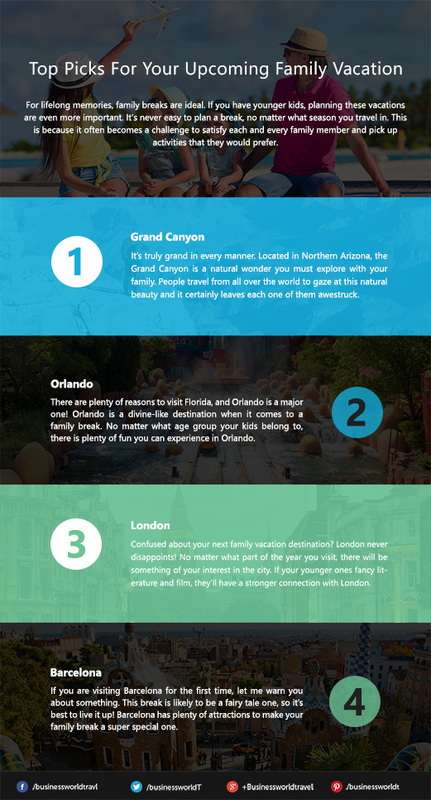 The Walt Disney World Resort is only one of the many attractions why tourists fall in love with Orlando. From nature to interesting museums, you’ll never be short of options while you are there. It’s surely one of the best destinations when it comes to endless fun and adventures. A vacation to London is surely a travel dream come true. London is one of the ideal destinations when it comes to family travel. From River Thames to the astonishing museums of the city, you’ll never become weary of what London has to offer to your family. A family break to Barcelona is also one of a kind. With plenty of fiestas, beaches and timeless attractions, it is an absolutely amazing place to spend your vacations! Nature lovers experience everything differently. Their destination pick is not dependent upon fancy hotels and luxurious holiday; rather all they want is maximum exposure to the nature where they find it easier to be themselves. Luckily, the planet is full of amazing places for nature lovers. 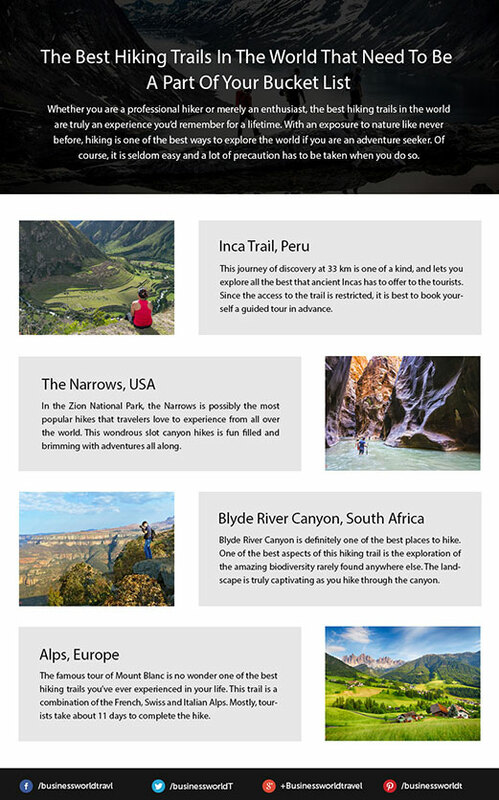 If you are one of them, here are some outdoor adventures you would love to indulge in! Gardening is the simplest of them is you have a very limited budget. Nothing would delight you more than the sight of flowers blooming in your garden and adding a whole new life to everything around them. If you are at a beach, walking barefoot is what some traveler love! There’s nothing better than going for a long walk along the beach and get in touch with the nature. If you are a nature lover, gokotta is one of the most delightful morning rituals. Once you leave your comfortable bed, you’d be delighted to enjoy the best morning picnic. Nothing beats welcoming a new day by listening to the bird songs. It’s truly a treat for the nature lovers. Hiking is also a very popular adventure. It takes stamina and strength, but is surely one of the most amazing ways to discover a new destination. If you like to be more creative with your plans, you can also set up a camp, gaze at the stars and have the time of your life! Many of us despise economy class flights. However, we have limited choice when it comes to the very high first class fares. If you go through the economy class phobia every time you travel, here are some ways you can make it better for yourself. Getting upgraded to first class maybe rare in today’s times, but you must try your luck. There are many airlines that are still generous when it comes to first class upgrades. A lot of times this won’t show on the website, always get in touch with the airline. If you get your booking done in advance, it is best to secure your seat. Not all airlines allow that to happen. SeatGuru helps you select your seat with an interactive map. As a rule of thumb, it is always best to get the window seat if you want to enjoy a peaceful flight. If you wish to get up every now and then, an aisle seat would be good for you. To experience the joys of first class travel, it is best to prepare a travel kit. A good quality travel pillow and eyes mask can help you escape the misery of economy class. Carrying a blanket also helps a lot! If you don’t fancy airline food, get snacks of your own from the duty free and fly in a luxurious manner with your coach ticket. Airline policies can often get very confusing for infrequent travelers because there is always so much to be mindful of. To make matters worse, airlines keep on changing their policies every now and then. As a rule of thumb, you must always study the airline policies before you’re off to the airport. It comes off as a surprise to many that air passengers have rights too. 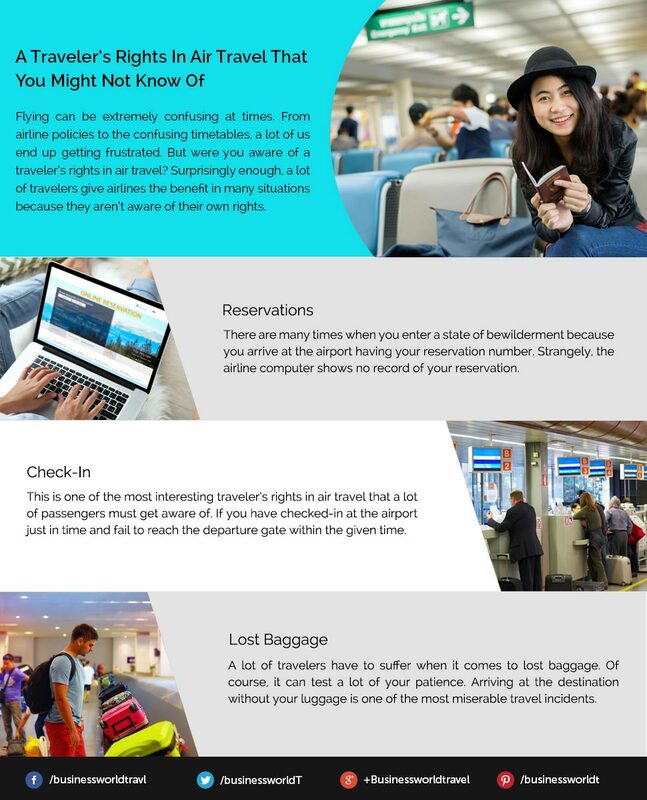 Here are some traveler’s rights in air travel that you must know about! The first one is regarding the reservations. There will be times when you merrily walk to the airport and find out the airport staff can’t locate your reservation number on their system. As a rule, the airline can’t deny you from boarding as long as the reservation is confirmed from your end. Always carry your ticket or reservation number as a proof. Even when your reservation is confirmed and you check-in just in time, the airline still has the right to cancel your reservation if you don’t arrive at the departure gates within the given timeframe. You may think you can get away because you have already booked your seat. However, the airline also has the right to give your seat away to someone else. In case of delayed baggage, you need to file a claim with the airline. You’ll be given a certain compensation depending upon how well you rest your case. In case of lost baggage, you’d have to file a second claim to get compensated. If you wish to experience how a post card comes alive, a trip to Ecuador is an absolute must! Although the humble size of the country is likely to disappoint many travelers to begin with, there is so much Ecuador offers to its tourists that is likely to keep them captivated throughout their trip. Ecuador truly defines what it is to have a perfect holiday, and here are some of the top reasons to visit Ecuador. One of the most obvious reasons for picking up Ecuador is the ideal weather all year round. The country celebrates spring no matter when you plan to visit. For travelers living in colder regions, Ecuador turns out to be the perfect destination. This weather can best be enjoyed by the stunning beaches of the country. Not only are they extremely picturesque, but also home to some of the finest adventures you could possibly dream of. The Salinas and Galapagos Islands are some of the best places to enjoy the wonderful beaches of Ecuador. In the country, you wouldn’t have to worry about the foreign exchange as U.S. Dollars is the currency commonly accepted. The cuisine offered in Ecuador is extremely appealing to the taste buds. Despite the small size, you’ll come across a variety of cuisines as you travel through the country. One of the top reasons why you must plan a trip to Ecuador soon is that the country is budget friendly around the year. With so much to offer, it is surely an attractive choice!